Yesterday was the Flea Market in Animal Crossing! I almost forgot to participate (despite having caught a bunch of fish and leaving them in my house earlier this week… lol) but luckily my boyfriend reminded me after I got off work! 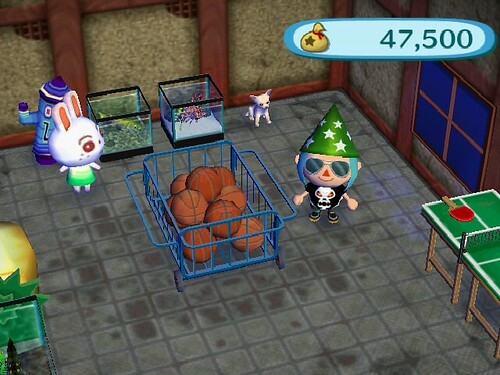 I was all set to sell off the stupid fish. Not that I had displayed anything that great, my best catch was a Pike, but I was hoping to make some money. Much to my surprise, my neighbors didn’t really want any of my dumb fish. To be honest, I had left all my DLC out on display because I didn’t think the neighbors would be interested in buying any of it. I was very wrong. 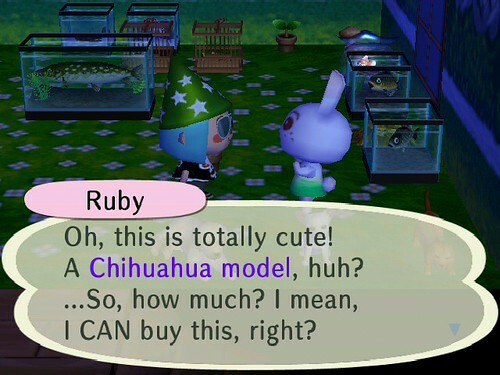 When I started the Flea Market, I had all three Nintendogs on display – the Labrador, the Chihuahua and the Dachshund. Three different townies bought each of them, and are happily displaying the doggies in their own houses! It’s pretty cute. While I was surprised that the townies wanted to buy DLC, I wasn’t too surprised that they wanted my dogs. After all, they are super cute. But I was really SHOCKED when a different DLC item (one that I particularly hate) was suddenly a ‘must-have’ for a few of the male townies. I was like WHAAAA? 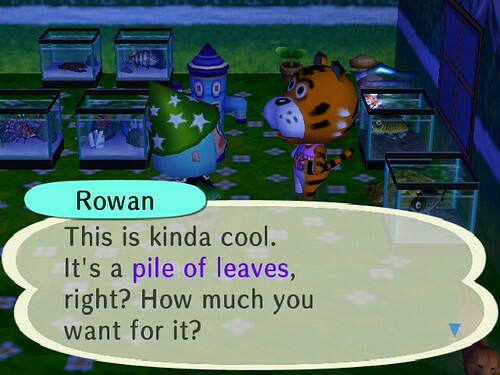 Both Rowan and Chester snatched up the stupid pile of leaves DLC. I charged em 50 bells each. Chief gave me a bit of a scare today too. He was talking about things getting stale around here and maybe it was time for him to move away. Oh, and before I go, another message in a bottle washed up on shore again. The note wasn’t quite as long as usual… I think the author, Pippin, is getting a bit disgruntled. Greetings to you, my mysterious friend. I hope this note finds you in good health. All is well here in the Shire. I suppose. Frodo has not yet left his bed. Merry and Sam have been equally useless and just laze about, leaving me (usually not the most responsible hobbit!) to carry on with the daily chores. I’ve been attempting to rebuild the main roads across the Shire. I created a lovely paved road and started laying out the pathways. Unfortunately, many trees have gotten in the way of my route. I know my friends the Ents would hate me forever if I chopped down a tree… but I’m starting to fear that I have no choice. Though I’m sure if I planted a sapling elsewhere, that might make the Ents less cross. Now if only I could find some rare fruit. One sole coconut washed up on the beach, so I planted it. I received a message in a bottle too – part of me hoped it would be from you, my mysterious friend – but no, it was some strange advertisement! While it’s been a bit melancholy to live in the Shire since the rest of the hobbits have moved on, I noticed that the new town Mayor, a crotchety old turtle named Tortimer, has been making an effort to keep things interesting. He hosted a Fishing Tournament yesterday, which I joined in on. I submitted a rather fine Red Snapper, which beat Benedict’s score. I wonder if I have won? Tortimer has tight lips and wouldn’t say, and then he disappeared when the sun went down. How very odd! There’s been no further sign of any UFO since my last note. 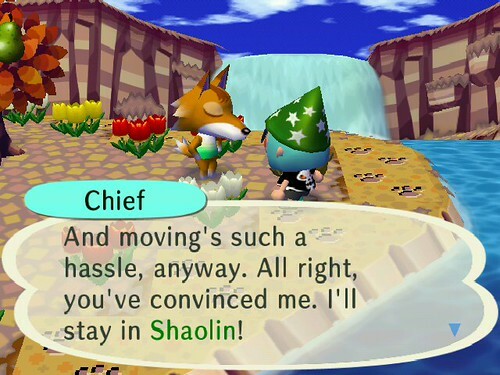 Tom Nook (that old crook…) upgraded his store to what he calls Nookway. I have not added any new deposits to his outrageous house loan. He will just have to wait! Well, that’s about all I have to say for now. Please keep your eyes on the shores for a new note from me! And PLEASE send a barrel of beer to the Shire!